As international educators, we understand that global learning leads to a more engaged and welcoming United States, and a more secure and peaceful world. To be fully realized, these goals require a functioning immigration system. Our immigration law is the face the United States presents to the world. When it is broken, when the welcome mat is only out for some or pulled away entirely, the world takes note. immigration law impacts international education by dictating who may come to the United States, for how long, and what they can do while they are here. International education suffers when the law makes it difficult for international students, scholars, researchers, and others to come to the United States to learn and work. Additionally, by prohibiting the family members of international students from working or studying while they are in the United States, we send a message that they are not welcome, and add additional burdens for international students and scholars to endure. Perhaps even more troubling is the way our current immigration law impacts the story we tell the world about ourselves. Our story is one of a nation of immigrants that welcomes new people who aspire to work hard and become Americans. Too frequently, in too many places in the world, our aspirational story has been eroded by a perception of anti-immigrant rhetoric and laws targeting immigrants for capricious or harsh treatments. As a result, our ability to achieve the goals of international education are crippled. Reforming immigration law supports the mission of international education, advancing global engagement by welcoming people from around the world to live, work, and study in our communities. Attacks against people who don’t “look” American are attacks against international education. When immigrants are targeted in a community based on race, ethnicity, or religion, this impacts those engaging in international education, whether those attacks are directed at international students or not. In some instances, immigrants to the United States have fled literal attacks on their safety. 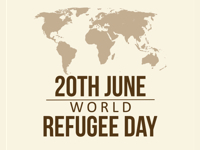 As we observe World Refugee Day on June 20, it is important to note there are places in this world where students are unable to attend school or even safely exist. They seek the chance to make the most of the opportunity our country promises. Denying entry and access to education to these vulnerable immigrants because of where they come from is not only wrong, but cruel, myopic and the antithesis of what we stand for. Therefore, we stand up against anti-immigrant rhetoric and support those who work to create a commonsense immigration process. NAFSA collaborates with other advocates to advance immigration reform in various ways, such as joining a friend of the court brief filed with the Supreme Court in support of the President’s executive actions on immigration reform, and supporting a bill that would prohibit a religious test to be used to determine who could enter the United States. And NAFSA will continue to do so. Internationally renowned American author and poet Alice Walker is quoted as saying, “The most common way people give up their power is by thinking they don’t have any.” International educators have power. We must stand together and use that power to help create an immigration law that meets the needs of international education. To get involved in immigration advocacy campaigns, sign up for action alerts on www.connectingourworld.org.